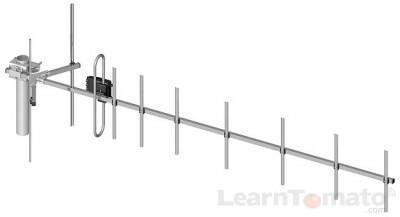 In this section, we’re going to discuss how to increase WiFi range using the right antenna for the job. We’ll discuss various antenna types, how they work, cable lengths, and coupling requirements. 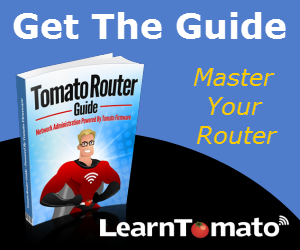 Most of you will be using the default antennas that come with your router. But for those of you planning to boost your range, using the right WiFi antenna can save you a lot of time and frustration. And with some basic knowledge about antennas, you will be better prepared to troubleshoot problems and plan your deployment. First and foremost, frequency wavelength plays a key role in the construction of the antenna. But other factors such as channel width, frequency, and spectrum are equally important. Direction refers to the shape or angle of the transmission, which ultimately describes the coverage area. Polarity is the orientation of the electric field (the transmission itself) from the antenna. Gain is the amount of energy increased by the RF signal. What is an omnidirectional antenna? For starters, Wi-Fi antenna’s are either omnidirectional or directional. 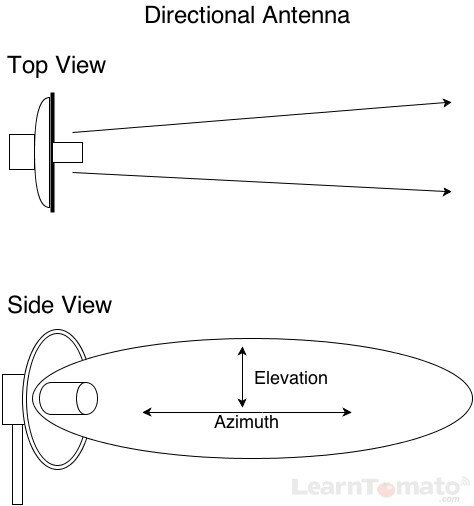 Omnidirectional antennas are designed for 360 degree operation whereby a vertical dipole radiates and receives equally well on the azimuth plane (in all horizontal directions). Wi-Fi antenna’s have two frequency planes. The Horizontal plane (also called “Azimuth” or the “H plane”), and the Elevation plane, (also called the “E plane”). The following image illustrates the transmission pattern of an omnidirectional antenna. For omnidirectional antenna’s, think of it like a doughnut wrapped around your finger. Your finger is the antenna, the doughnut is the wireless signal. Noise, interference, walls and other obstructions take bites out of the doughnut making it less round. 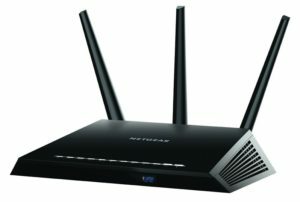 Most wireless routers are shipped from the manufacturer with small omnidirectional antennas. These are often nicknamed “rubber ducky antenna’s”. There may be times when your rubber ducky just doesn’t cut it. When you need more range, a directional antenna might be your best option. 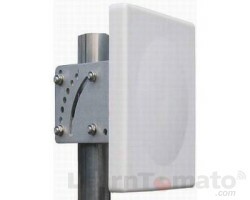 What is a directional antenna? Think of directional antenna’s like a water hose with a garden sprayer. When you squeeze the handle, the water is sprayed in a straight line. When something gets in the way, the pressure will either blast through it or bounce off if it, depending on the density of the object. Since directional antenna’s focus their energy in one direction, they are excellent for controlling the direction of the broadcast, or receiving a distant broadcast. 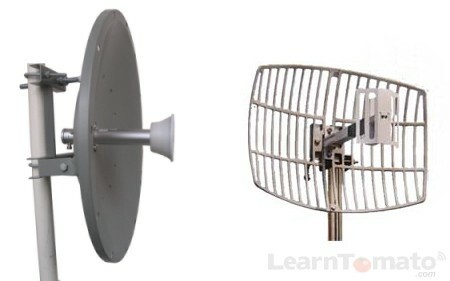 There are various types of directional antenna’s including: Flat Panel, Yagi, Parabolic, Cantenna, Bi-quad, and Fractal. Flat panel antenna’s are ideal for environments that require a broad directional signal such as down a corridor, or into a particular part of a building. Flat panel Wi-Fi antenna’s typically have a Horizontal plane coverage angle of between 35 and 120 degrees wide. Yagi antenna’s have a narrow coverage angle, typically between 12 and 25 degrees wide. Yagi’s are excellent for wireless point-to-point environments. They keep the signal narrow on both planes which helps battle interference. One downside is that they can be somewhat challenging to point. The longer the distance, the more accurate the antenna must be aimed. Another downside is that birds like to perch on them. Parabolic antenna’s work by reflecting the signal off of the rear reflector and concentrating that signal into one central point. If you want to test the parabolic theory, hold a large bowl in front of your face and speak into it. The audio from your voice travels to all corners of the bowl, but when it’s returned to your ears, the sound is magnified. Like the Yagi antenna, parabolic antenna’s are a common choice for point-to-point environments. The coverage width and elevation is comparable to that of a Yagi antenna. The “dish” is more prone to wind, snow, and ice. Consider using a “grid” antenna for areas with high-wind and freezing weather. 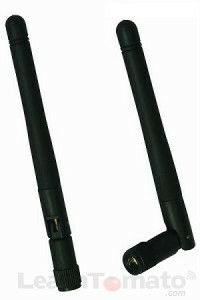 Cantenna’s are mostly used as a receiving antenna for client computers. Most people use them to replace the rubber ducky antenna’s on their wireless USB adapters connected to a laptop. Cantenna’s are a great addition to your travel case. They can help you reach Wi-Fi hotspots that might otherwise be out of reach. There are a lot of DIY enthusiasts these days. Many of them post images and plans of their homemade antenna’s. Some are downright ugly. Others are quite impressive. They’re made from everything you can imagine: coffee cans, Pringles cans, trash can lids, etc. Regardless of the type of antenna that you use, there is one thing that absolutely must be correct and that is the polarity. The broadcasting and receiving antenna must use the same polarity. Good performance is all about a strong signal. Radio wave “polarization” plays a huge part in signal quality. 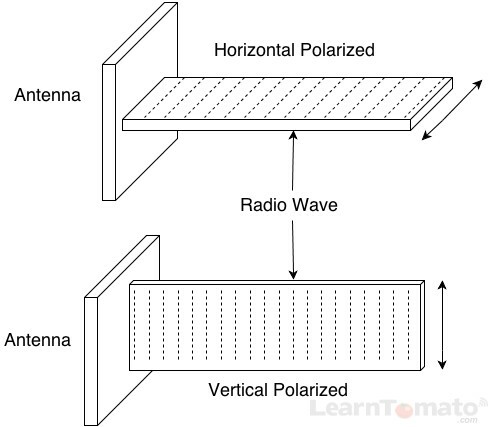 Polarization is determined by the physical position of the antenna. Polarization is extremely important. In fact, if you had two antenna’s pointing directly at each other, one with perfect vertical polarization, and the other with perfect horizontal polarization, the antenna’s would not hear each other at all. 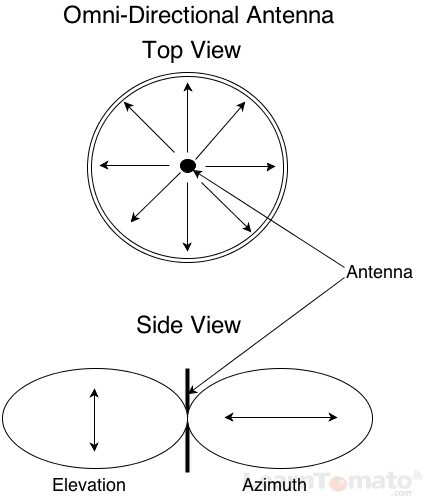 Omni-directional antenna’s are vertical polarized. A Yagi antenna with vertical elements is also vertical polarized. 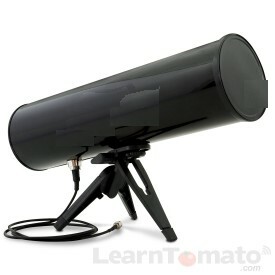 But if you turn the antenna so that the elements are sideways, the antenna is then polarized horizontally. 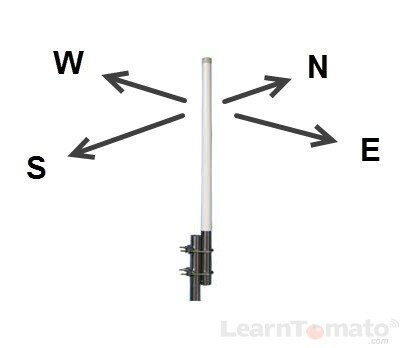 The range and strength at which an antenna can connect depends on the antenna’s gain. Some people say “power” but what they really mean is “gain”. Unlike the actual radio transmitter itself, antenna power is not measured in output power. It’s called “gain” and it’s measured in a relative unit known as “dBi”. For the transmitting antenna, gain is the measurement of how well the antenna converts the transmit power into a radio wave that can be sent. On the receiving end, it’s a measurement of how well the antenna receives the radio wave and then converts that to electrical power. What is dBi and dBm? This can make your head spin when shopping for antenna’s. Just remember, the general idea is to reduce the amount of loss and retain as much gain as possible. Antenna Gain and Cable Loss are values that are constant no matter what power level you are referring to. Antenna gain is affected by “cable loss”. Cable loss is associated with anything that decreases the antenna’s gain, such as the length and/or diameter of the antenna cable. dBi is an “isotropic measurement”. That’s just a fancy way of saying that dBi is a relative measurement. So, it doesn’t really matter what level of power is in question, the dBi remains the same. dBm refers to the ratio of decibels (dB) to milliwatts. The referenced unit is exactly one milliwatt. Since it uses a reference point of exactly one milliwatt, it is an absolute unit of measure. The conversion of watts to dBm uses a complex formula that goes beyond the scope of this section. In short, 1 watt (or 1000mW) is equal to 30dBm. If you have cable loss of 2 dBi (based on your cable length and diameter), but a gain of 7.5 dBi from your antenna, the net effect is +5 dBi regardless of the power level. 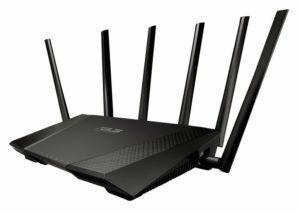 What cables should I use for my WiFi antenna? With outdoor applications and runs over 4 feet long, use low-loss cable such as: LMR-400. If you have a 20 foot run, use 19 feet of LMR-400 for the main line and the smaller LMR-100 cable for a 1 foot pigtail equipped with the connectors you need. Your pigtail may have an N Female on one end, and an RP-SMA Male on the other. 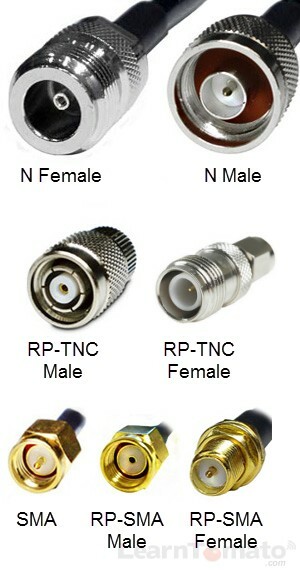 What are the most common antenna connectors? What about outdoor WiFi antenna’s? If you mount an antenna outdoors, make sure you use a lightning arrestor. 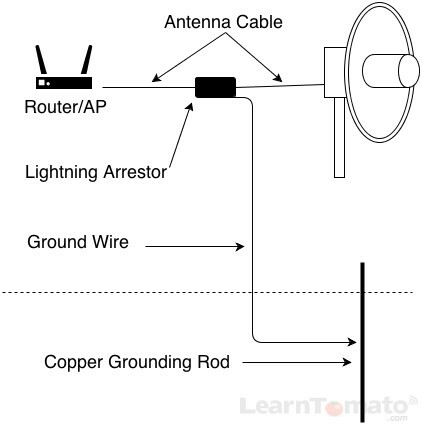 Lightning arrestors protect the router or access point from electric surges from lightning strikes on or near the antenna. Gas charged lightning arrestors offer excellent protection. They’re essentially a gas charged surge suppressor. They respond to electrical surges by safely dumping excessive voltage to the ground. Therefore, they must be grounded properly in order to work! This little guy can save your Wi-Fi radio from getting fried. Drive a solid copper rod (4 feet or longer) into the ground. Run a solid copper wire (8 AWG or larger) from the lightning arrestor to the grounding rod. Secure the ground wire to the copper rod with a with a grounding strap. Make sure it’s tight. If it’s not grounded properly, the lightning arrestor will be have nowhere to dump the excessive voltage. WiFi antenna’s are designed for specific frequencies (2.4GHz, 5GHz, etc). The direction of the antenna, the polarity of the signal, and the gain of the antenna are all for the intention of getting radio waves to and from the transmitter. Maximize signal quality by matching polarity. In order to get as much signal to and from the radio, the idea is to minimize loss and retain as much “gain” as possible. In order to achieve maximum gain, use low-loss cable. And last but not least, protect your indoor equipment from lightning. Use gas-charged lightning arrestors and secure them firmly to a copper grounding rod.